1985 – The Cray X-mp/48 Supercomputer begins operation in San Diego Supercomputer Center in California. The $15 million dollar supercomputer could process 400 megaflops (200 per processor). It was a shared-memory parallel vector processor and supported 2 or 4 million 64-bit words of main memory in 16 or 32 banks. The first Cray didn’t get installed until October 1986. Cray X-MP/48 replaced the Cray-1. It was succeeded by the Cray Y-MP8/864 in 1990. 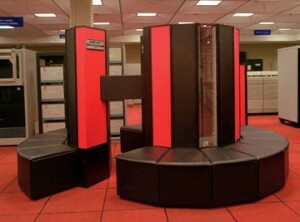 Movies such as “the Last Starfighter” were rendered using the Cray Supercomputer.